I was visiting one of my favorite food blogs yesterday, “the kitchn” and read: how to cook perfect steak in the oven. Inspired, I drove to my neighborhood market. Thank goodness this market features fine grass fed beef. I bought 2 lbs. of rib-eye and gave the “Steak in the Oven” a try. I use a Weber with mesquite briquettes when we grill, therefore, I have been wanting to find an oven recipe that would turn out a nice steak. And I found it! This was perfect, melt in your mouth steak. If you are like me sometimes you just don’t want to build a briquette fire. Also, if you are somewhat like me sometimes you’ll discover you haven’t cleaned the ashes out in awhile and that adds another daunting task! Not to mention living in Seattle….rain. I wish I would have known about this all those years I lived in an apartment. I found the parsley sauce a few summers ago in a copy of Martha Stewarts Food Everyday cookbook. I always serve this with our steaks. I call it chimichurri rather than sauce. 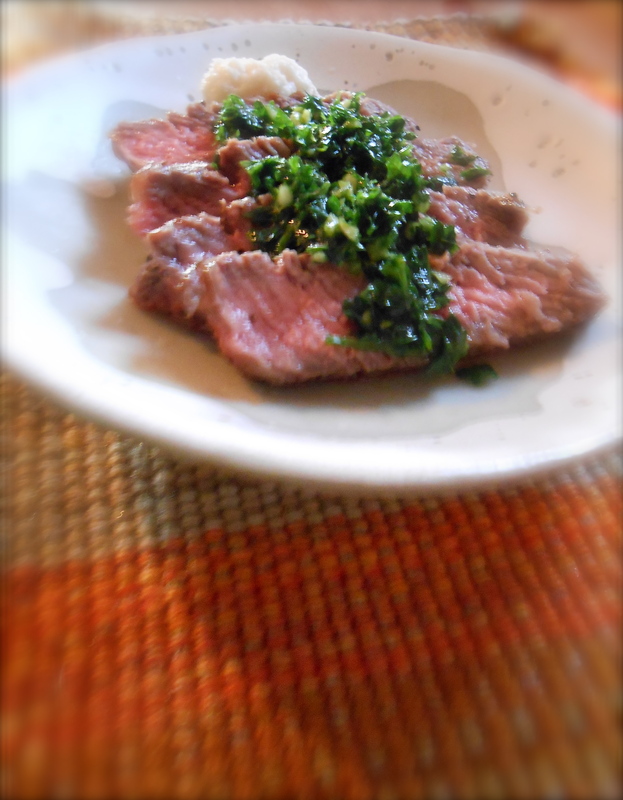 Chimichurri is an herb condiment sauce that is considered a culinary specialty of Argentina. 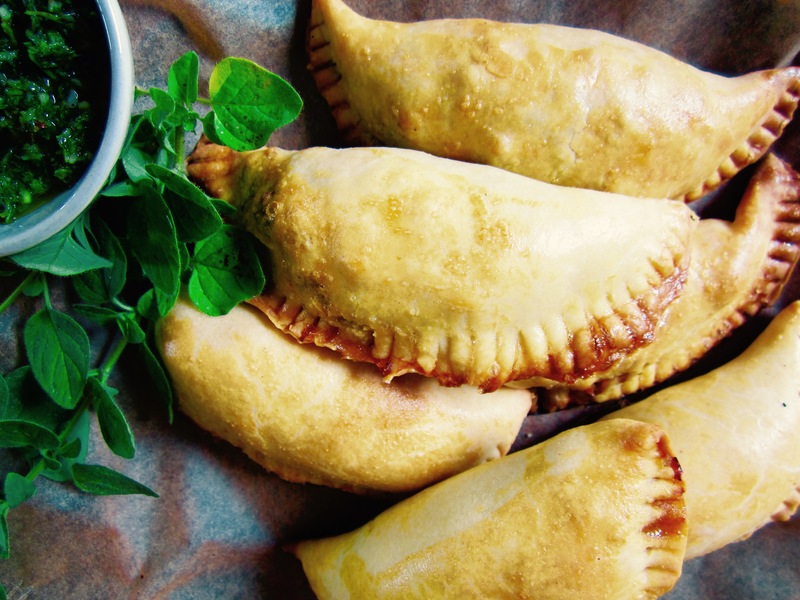 Typically served with grilled or roast beef. I read one definition of chimichurri being a “condiment for food” and loosely translated as “a mixture of several things in no particular order”. And of course…if you have a palette for it, don’t forget the horseradish! As mentioned in the kitchn recipe, the most important step is buy a good steak. Grass fed and humanely butchered. For a more intense flavor buy a dry aged steak. You will spend a little more, and it is worth it. We only have steak once in awhile so I don’t mind spending a little more on good quality beef. Use a paper towel and blot your steak dry and allow it to come to room temperature. Turn on your oven to broil. Place a cast iron skillet in the oven, allow it to heat up as the oven is heating. Generously brush one side of your steak with oil. I used olive oil instead of canola or vegetable oil. I read some folks may have had a problem with the oil smoking while it was broiling. I didn’t. It worked perfect for me. Sprinkle salt and pepper and pat it into the steak so it will stick. Turn the steak over and do the same on the other side. Brush oil on the edges too. Turn your stove top burner on high heat. Remove cast iron skillet from oven, place it over the high heat burner. Using tongs place the steak in the hot skillet. Cook for 30 seconds! I counted 1001, 1002, 1003…etc. Using tongs flip it over and do the same on the other side. Then return the skillet to your broiler. Cook the steak 2 minutes for medium rare, 3 minutes for medium. Make sure to use a timer! Using tongs, flip the steak over and do the same on the other side. Remove steak from oven and put it on a large cutting surface. Using foil make a tent and place it over the steaks for about 5 minutes allowing it to rest. For presentation, rather than just serving your steak as a whole piece of meat, slice the steak. Slice it against the grain. I like slices to be 1/4″ thick. 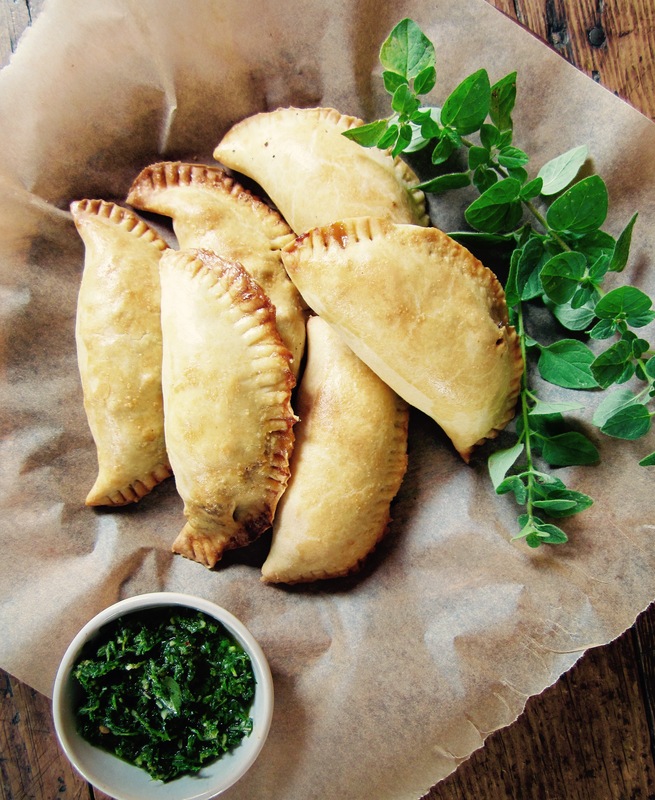 Serve with a spoonful of parsley chimichurri on top. In a blender, puree the garlic, parsley, olive oil, and 3 tablespoons water until smooth. Season with salt and pepper. You are currently browsing entries tagged with chimichurri at COTTAGE GROVE HOUSE.